The Caribbean Sea provides for and supports its people. Incredible sandy beaches draw tourists, while lobsters and conch support local fishermen, and mangroves and coral reefs protect islands from the full force of hurricanes. However, the Caribbean faces substantial challenges: reefs are degraded and algae-infested, and once-abundant fish are now harder to find. Recognizing the challenges, many Caribbean nations are creating Marine Protected Areas (MPAs) to permanently protect key ocean and coastal habitats. ELI’s is supporting these efforts by working to ensure that Caribbean MPAs have a strong legal foundation that supports effective compliance and enforcement. 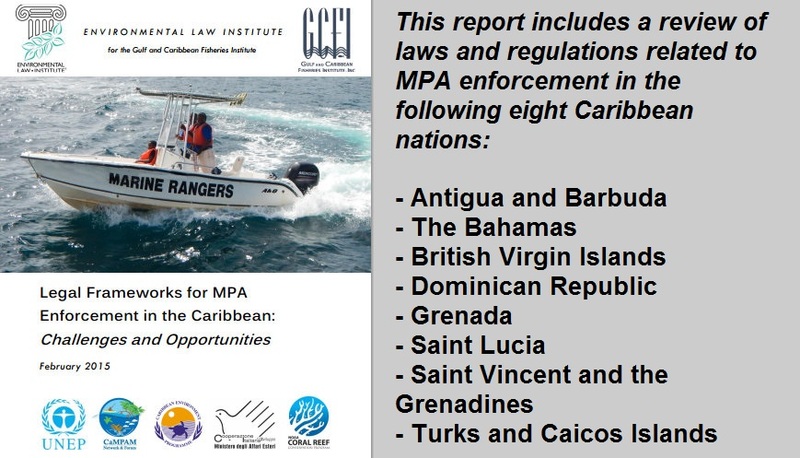 Our new report fulfills a recommendation by Caribbean MPA enforcement officials, comparing enforcement provisions found in Caribbean nations’ MPA legislation. Click here or the image below for the full report. In 2012, with support from NOAA’s Coral Reef Conservation Program (CRCP), the Gulf and Caribbean Fisheries Institute (GCFI) organized the first regional peer-to-peer workshop on ‘Building Compliance and Enhancing Enforcement for Marine Protected Areas in the Caribbean’, hosted by the Florida Keys National Marine Sanctuary and facilitated by MPA Enforcement International. Twenty-two MPA managers from fourteen countries and territories attended. In the course of the workshop, the participating MPA managers identified a common need to better understand best practices in MPA legislation. They expressed an interest in comparing MPA legislation across the Caribbean and in promoting the adoption of successful legislative techniques in their home countries so as to help achieve a more uniform approach to MPA enforcement throughout the region. This report seeks to address this need and to inform future efforts by Caribbean MPA managers and policy-makers to strengthen MPA enforcement. With this information, individual countries and the region as a whole can better understand the legal basis for MPA enforcement and identify important reforms to improve marine protection in the Caribbean and beyond.